"For the first 44 minutes, we were the best team," he said. "After we conceded, we were the second best. The typical thing for when a team is struggling. "You concede at the worst moment after a good performance in the first half. Going 1-0 down was a big blow and we never recovered from it, which was a very bad thing. "We have to score when we play 45 minutes like that. Of course, not having Lookman, Gudmundsson and then Vaz Te coming off it did not help things. "This game was as important as any other. Everybody saw that we did not come for a draw, we did not come and park the bus. We came here to win and we deserved to be up in the first half, but instead we concede one minute before half time and we go back to the changing rooms 1-0 down. "We have made things difficult for ourselves. We were 2-0 up against Bolton and gave it away, 2-0 up against Brighton and gave it away. Today, we were not rewarded for our first 44 minutes and then we were punished." 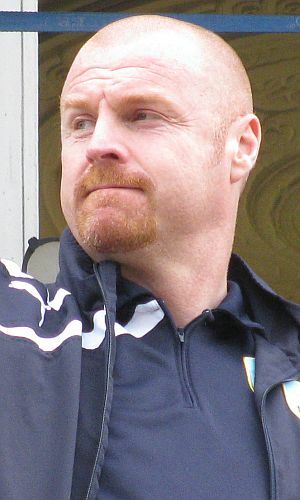 Sean Dyche finally saw his side win after a run of six games without victory. After seeing a Burnley side under his management net four goals in a league game for the first time, he said: "I am really pleased. I've not been too unhappy even though it's been a tough little spell. "There's a big thing in football called perception and it's my job to see through all the noise. If you asked anyone about Brighton, I guarantee people would say what a fantastic run they have been on ahead of today, but in the last ten games we've taken 16 points and they've taken 15. "The margins can be tight and today we have taken our chances; probably only about two-thirds of them with no disrespect to Charlton, because in the second half it could have been more than four." He added: "Our fans have been really patient and the game was flat in the first half. The ball was swirling in the wind and they were dampening the game by taking their time with everything. "The lads were a bit edgy, but players are only human and that little bit of anxiety creeps in. It's hard for players these days to not question themselves because they get bombarded with opinion from outside, but they have delivered today and that focus will always remain on the challenge, which is the next game and not get too involved in the outside perception. "Our belief and our expectation of ourselves is as strong as anything and the players dealt with that well today. "We got the goal and the message at half time was to relax and play with freedom and in the second half they did that and some of the play was as good as I've seen here at times. The second half was borderline excellent." After the disappointment at Middlesbrough, he made two changes with both Tendayi Darikwa and David Jones left out for the first time since they joined the club. It meant a first home appearance for Dean Marney. Dyche said: "I am pleased for Deano and it was very hard on David because he's been fantastic and I've told him that. It's probably one of the hardest decisions I've had since I've been here, because he's been excellent, but I have to make a judgement call and that was the same with Matty. "Tendayi has done a superb job and is still learning the job, whereas Matt is probably the more rounded player in general, but he's had to wait his turn. His performance was good today, along with many others including Sam who has been playing well but hasn't quite nicked one. "There were a lot of good signs today and the fact is we are still on course. The challenge is massive, but there is a lot of life in what we are doing here."